Copyright holders commonly ask torrent sites to remove links to pirated content, such as the latest blockbuster movies. However, Sony Pictures Networks goes a step further. This week the Indian company sent a stark warning to torrent sites, urging them to keep an eye out for pirated versions of an unreleased film, or else. While it’s not widely publicized, many larger torrent sites regularly remove links to infringing files. This allows copyright holders to somewhat limit the availability of their works on the Internet. Generally speaking, movie studios and other rightsholders hire anti-piracy companies to track down infringing content. These outfits then send takedown notices to the sites in question. In India, the local Sony Pictures’ representatives are taking a different approach. This week they informed several torrent site operators about their upcoming release, Azhar, which premieres in theaters today. However, instead of linking to torrents or specific URLs, the notice is a general warning urging site owners to keep the film off their sites. 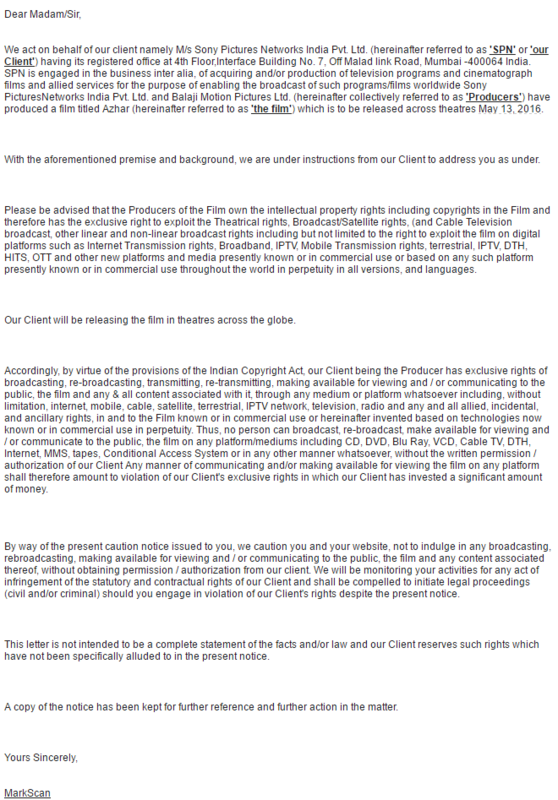 Citing the Indian Copyright Act, the company warns that distributing the film would break the law. “By way of the present caution notice issued to you, we caution you and your website, not to indulge in any broadcasting, rebroadcasting, making available for viewing and / or communicating to the public, the film and any content associated thereof, without obtaining permission / authorization from our client,” the notice reads. Sony Pictures Networks‘ anti-piracy partner MarkScan adds that they will keep a close eye on the developments, and warns that civil or criminal lawsuits may follow if the warning is ignored. “We will be monitoring your activities for any act of infringement of the statutory and contractual rights of our Client and shall be compelled to initiate legal proceedings (civil and/or criminal) should you engage in violation of our Client’s rights despite the present notice,” they write. While the language may sound intimidating, the torrent site operators we spoke with have no plans to take preemptive action. Besides broad keyword filters, there are few options to prevent users from uploading content that’s not available yet. At the time of writing we haven’t seen any pirated copies of Azhar on torrent sites, but the soundtrack is widely distributed. Despite the threats, it’s likely that the movie will follow soon after the first releases leak online.